We believe farming through organic practices such as composting, cover cropping, and integrated pest management helps us manage pests and diseases while having a positive environmental impact. Healthy plants grow from healthy soil, and organisms large and small thrive when time is taken to create beneficial environments. We like to think of ourselves as a salad farm. This means we mainly specialize in growing the ingredients you need for a delicious salad! 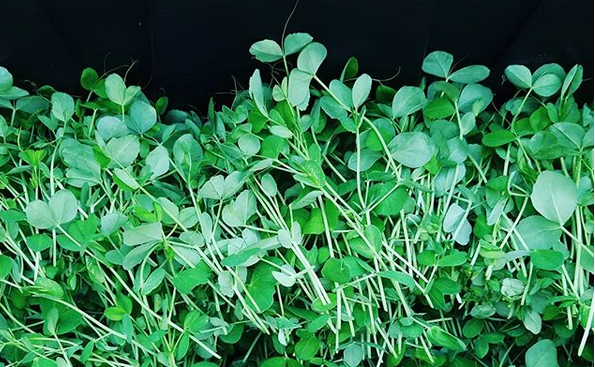 We grow a variety of leaf and head lettuces, specialty greens like arugula and spinach, and microgreens to add a boost of nutrients to every meal. While these are our main crops, we also grow small root crops (carrots, beets, turnips, radishes, etc. ), leafy greens (kale, chard, bok choy, Asian greens), small fruiting crops (tomatoes, peppers, summer squashes, cucumbers, etc. ), culinary herbs, and cut flowers. Organic farming can feed the world if enough of us choose to support alternative food systems. Thank you for your interest in our farm, please contact us with any questions or comments. Visit us at the Farmers Market! We use as much practical season extension as possible, and try to provide as much variety as each season and our space will allow. High tunnels and row cover help us have a longer and more diverse growing season. Thanks for choosing to eat seasonally! Anything you'd like to see added to our list? Please feel free to contact us below, we love hearing from our community!